There are many things one can call Dear Esther, which is what makes it such a dynamic experience for anyone who plays it. For me, I was woefully late to the show, and feel like the ubiqituous basement dweller catching a hollywood smash hit years later on DVD. I missed the hype, the reviews, the remarks, the discussions, the theories–all which were born out of one of the best interactive stories ever in my opinion. I am late, but I am not ignorant any longer as to how good Dear Esther is. Dear Esther concerns a narrator locked on a dreary island, wandering around and remembering his past through soliloquy. Letters concerning a woman named Esther are randomly generated at key locations on the island and a grand symbolism regarding a biblical tale I am unfamiliar with ties it all together. In essence this is a playable story, with next to zero interactivity and game play besides walking and moving and looking. 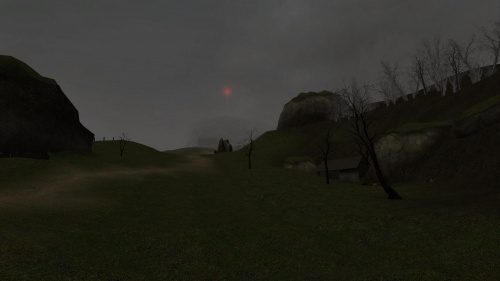 Unfortunately locations at this time are quite “simple” looking as the mod is quite old, but the music and voice acting still stands the test of degration over time. They sound great, and still tell the tale they were designed to quite easily. This might be a woefully short review however, as Dear Esther “is what it is”. To describe the story would be to diminish your experience and I cannot comment on graphics since they are quite old, or the game play, puzzles or anything of the sort as there aren’t any. I can say that if you’re a fan of stories from Poe, mixed with the odd vibe of And Then There Were None, thrown together into a romantic spin (There is no horror or mystery here by the way) then you’ll enjoy what you play. If you find yourself bored by story-first games, however, you need not apply.